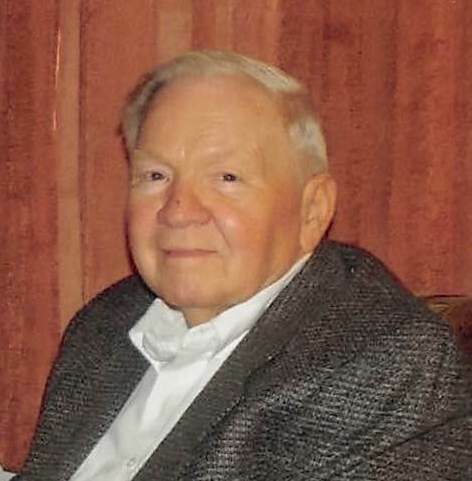 Edwin Roy “Eddie” Johnson, 88, died on Tuesday, December 4, 2018 at the Rose Vista Nursing Home in Woodbine, Iowa. Eddie was born on October 22, 1930 in Pisgah, Iowa to parents Roy and Inez (McWilliams) Johnson. He grew up in Pisgah and graduated from Pisgah High School in 1948. Eddie then began working for McKinney Seabury’s. He was then drafted into the U.S. Army. After his honorable discharge he returned to Pisgah and went to work for Byron Swain at the Swain Motor Company. Eddie married Myrtle Louise Lathrop on December 18, 1955 in Pisgah, Iowa. Eddie eventually purchased the dealership and operated the Eddie Johnson Ford Dealership in Pisgah. Eddie retired in 2005. Eddie always wanted to live in Pisgah. He was always interested in cars, old cars, antique cars, car auctions, swap meets, car collectibles, NASCAR and camping. Eddie was preceded in death by his parents and his brother James Johnson. He is survived by his wife of almost 63 years, Myrtle Johnson of Pisgah, Iowa; four children, Kimberly and her husband Patrick Fischer of Omaha, Nebraska, Bruce Johnson and his wife Jane of Linn Creek, Missouri, Shelly and her partner Larry Herbig of Lee’s Summit, Missouri and Karen and her husband Michael Brainerd of Bennington, Nebraska; six grandchildren; three great grandchildren and many other relatives and friends. The Johnson family suggests memorials be directed to the Pisgah Volunteer Fire Department.